The boys' father hopes the video will raise awareness of the dangers of falling furniture, The Independent reports. 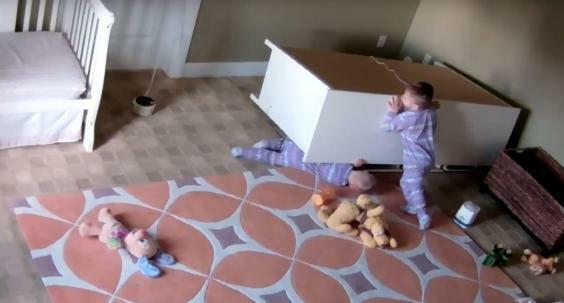 In-home surveillance cameras captured the moment a two-year-old boy lifted a chest of drawers off his trapped twin brother. The boys had been playing in their bedroom in Orem, Utah, when the heavy piece of furniture tipped over, pinning toddler Brock Shoff underneath it. Twin brother Bowdy managed to avoid being trapped and set to work figuring out how to help his brother escape. Brock is clearly distressed as he attempts to wriggle out from under the dresser, and it is not until Bowdy manages to lift the corner that the trapped twin is able to escape. The boys’ mother, Kayli, had only stepped out of the room briefly when the accident took place.